In the West, Yoga is often associated with the physical postures known as asana which is one of the eight limbs of Patanjali yoga. 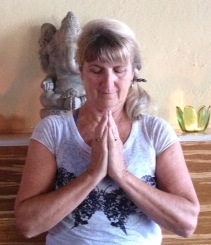 Sherry has an interest in developing the other seven limbs as well and integrating the deeper teachings of yoga with the asana practice. Studying with Bhavani Maki over the past 14 years, Sherry has developed a love of the yoga sutra, chanting, and contemplative practices. 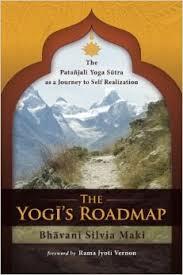 She was honored to work with Bhavani editing her book The Yogi’s Roadmap, Patanjali Yoga Sutra as Path of Self-Realization, 2013. 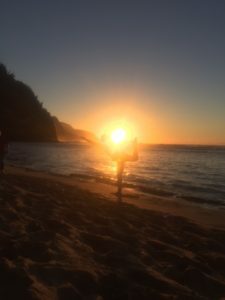 She has received her 200-hour Yoga Alliance certification from Bhavani and has also trained in yin yoga and restorative yoga with Judith Lasater. Sherry Cassedy is now bringing her enthusiasm for the deeper teachings of yoga to students through satsang, guided asana, and other offerings. Sherry blends a high level of knowledge and support with a deep sense of invitation and light-heartedness. Sherry is excited to announce the opening of her own Chrysalis Studio located in her home in Pleasure Point, Santa Cruz, CA. The small studio is a sheltered space for incubating growth and transformation of body, mind and spirit. Sherry offers regular Sutra study and satsang gatherings as well as small focused classes integrating exploration of physical posture and patterns with application of ancient wisdom. Contact Sherry directly for information and offerings. Satsang: (sat = true, sanga = company) means “gathering together for the truth” or, more simply, “being with the truth.” This generally involves chanting scriptures, reflecting on the source of these words and their meaning in our daily life. Satsang is an opportunity to delve deeper into the esoteric teachings of Yoga in the company of other seekers. Through discussion, chanting and pranayama we will listen to, talk about, and assimilate the truths of Yoga’s ancient teachings. A strong focus on the Yoga Sutras, this is a great introduction for anyone who is curious to learn more, and wonderful for others to revisit and share in the supported space of the Sangha as we deepen our practice. Sherry’s classes combine the yoga sutra with yin and restorative poses, as well as time for chanting, pranayama, and meditation, an immersion into the deeper understandings and experience of yoga. Easily weaving the sutra through the poses, her classes integrate body, mind and spirit in the yogic tradition, leaving the student relaxed, enriched and inspired.